Heavy spring rains or humidity can cause big problems for your garden tomato plants. 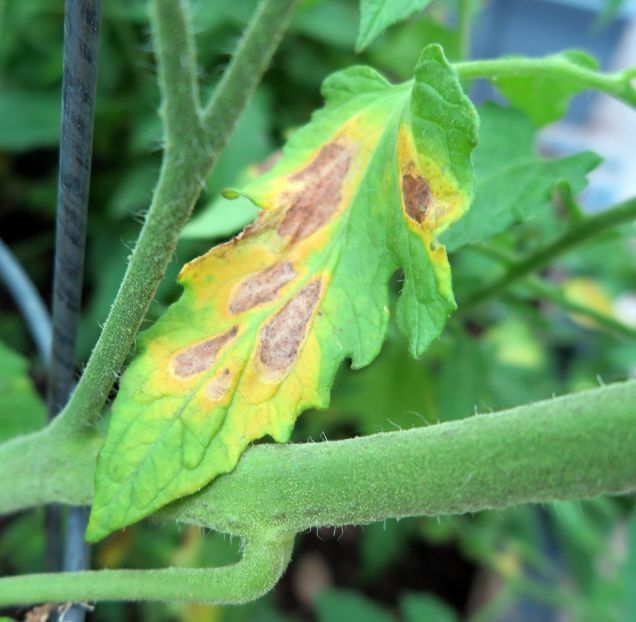 Early blight, Alternaria solani, is a fungal disease that can result from excess moisture or overhead watering. The disease is spread on the surface of plants by water splashes and usually infects older plants. Brown spots will develop on the leaves; surrounding areas turn yellow. Early blight can stunt plant growth, fruit set and fruit development resulting in lower yields. While early blight can affect most parts of the plant including the fruits they are still edible. Stressed plants are more suceptible to damage from early blight. Take care to water plants at the soil level, not on the foliage. You can use natural fungicides to slow down or prevent the spread of early blight. Remove affected foliage. If you’ve had serious problems with early blight and your plants are highly infected, it may be best not to add them to your compost but rather dispose of the plants.